Garage Services - Car and Vehicle repairs based in Benijofar is owned by Chris McCarthy, an experienced and time served motor mechanic with over 32 years experience. He has a fully equipped repair shop in Benijofar where, with state of the art equipment, he can carry out any car or vehicle repair, no matter how complicated it might be. Chris is fully time served so you can be assured that for all your car repairs and motoring repairs needs your car is in very capable hands. Garage Services can even come to you to carry out those smaller jobs at your home or place of work, saving you both time and money. So don't take chances with your car - trust the experts! Garage Services car and auto repairs is a top quality English speaking car mechanic company which covers Torrevieja and the Costa Blanca area. You will find our car repair and mechanic service second to none and our prices extremely competitive, also our customer service and attention to detail all that you would expect from a reputable English speaking mechanic business. So if you are in the Torrevieja Costa Blanca area and you need the services of a top notch English speaking mechanic then just contact Chris McCarthy at Garage Services car and auto repairs, car mechanic Costa Blanca and leave us to solve your problems. The company is allied to Checkatrade, a directory of trades and services that have been vetted to the highest standards in all areas of the business activity where insurance, technical qualifications and professional memberships are all fully scrutinize. Not only that, but they also monitor the work on an ongoing basis by collecting feedback directly from customers. Since 1998 Checkatrade have collected almost 300,000 customer reports which highlight the strengths and weaknesses of their listed companies. You know what you are getting. Recommendation, reputation, and a standard you can trust. To date Garage Services has had 315 reports submitted about his standard of work and gained a fantastic overall rating of 9.8 out of a maximum of 10. 5-"I am very pleased with the service and the courtesy from Mr McCarthy. I can recommend him"
These are just a few of the hundreds of positive recommendations Chris has received over the years - Why take chances! Garage Services. 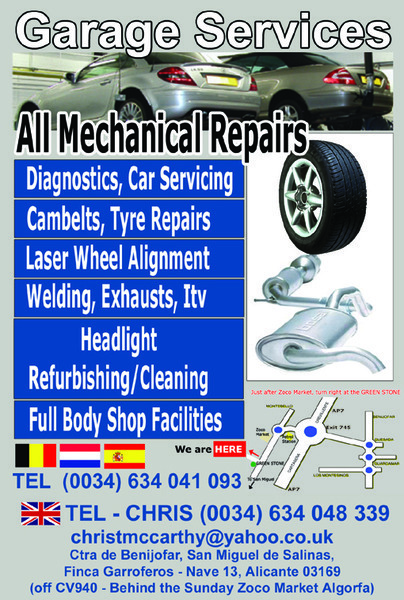 Ctra de beniofar-San Miguel de Salinas, Finca Garroferos-Nave13, Algorfa 03169 Contact Chris on (0034) 634 048 339 and have your car repaired by a reliable, expert and time served mechanic.